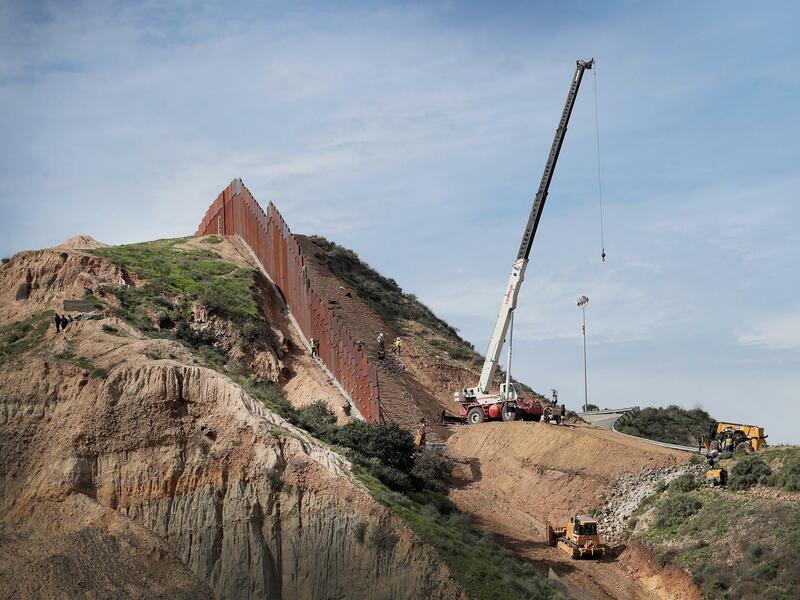 A section of border wall is constructed on the U.S. side of the border on Jan. 28 in Tijuana, Mexico. Congress and President Trump continue to spar over how much additional border security funding will be allotted. Congress also gave itself the ability to terminate an emergency declaration. In the more than 40 years since the law was passed, only one member of Congress has ever tried it. "It was a lever that we had," said George Miller, the former Democratic congressman from California. "We decided to use it." It was 2005, in the aftermath of Hurricane Katrina, when President George W. Bush issued a proclamation saying government contractors could pay workers less than usual for recovery-related projects. He justified it by saying the conditions caused by Katrina constituted a "national emergency" and waiving federal wage requirement would "result in greater assistance to these devastated communities" and "permit the employment of thousands of additional individuals." Miller and others in Congress saw it differently. There was a major natural disaster. Many of the people doing the recovery work would be victims of the disaster themselves, and "to suggest that they should work at lower wages was just an insult," Miller said. Miller introduced a resolution under the National Emergencies Act to terminate Bush's action. Under the law, the relevant committee had 15 days to consider the measure and vote. Fourteen days later, President Bush announced he would revoke his own proclamation. That was the closest Congress ever came to voting to rescind a presidential emergency under the 1976 law. To understand the intent of the law, it helps to understand the time when it was passed, in the wake of Watergate and the Vietnam War. "Congress [was], really on a bipartisan basis, reaching to claw back power from what was then known as an imperial presidency," said John Lawrence, who was a young congressional staffer and has gone on to write a book about the congressional Class of 1974. In the mid-1970s, Congress passed the War Powers Act and the Budget Act, it expanded its oversight functions, and "the National Emergencies Act, which was enacted in 1976, was very much in that tradition, an attempt to put constraints around the use of presidential power." At the time, there were nearly 500 emergency-related statutes on the books, granting the president special powers when he declared a national emergency but with little ability for Congress to constrain the president. The National Emergencies Act cut those way back. It required the president to specify which emergency authorities he intended to invoke once the emergency was declared. It required those emergencies to be renewed on a regular basis. And it created a fast-track mechanism for Congress to terminate a presidential emergency. "The catch was that for them to actually rein in presidential power, Congress would have to take action," said Andrew Rudalevige, a professor of government at Bowdoin College. "They'd have to pay attention. They'd have to be willing to go against the will of a president, even of their own party. They haven't done that." But that could change if President Trump follows through on his threat. A Democratic leadership aide tells NPR the House will "vigorously challenge any declaration that seeks an end run around Congress's power of the purse." That would likely include a resolution like the one Miller introduced in 2005. If the Democrat-controlled House were to pass it, the Republican-controlled Senate would have no choice but to vote on it under the law. Several Republican senators have been cautioning the president not to put them in that position. "I have real concerns about it, but I'm not gonna start talking about the floor strategy and how I'm going to vote and how the House is going to vote until we get there, and I hope we don't get there," said Sen. Roy Blunt, R-Mo. But if they do get there and a resolution were to pass, President Trump could still veto it. It's unlikely either chamber would have the two-thirds majority needed to reverse a veto. That high bar may be one reason Congress hasn't been more active in pushing back on emergencies in the past. Another reason is presidents have typically used emergencies in line with congressional intent, said Russell Riley, a presidential scholar at the Miller Center at the University of Virginia. But what Trump is contemplating would be different, he says. "Having gone to Congress repeatedly having not gotten his way with them ... you can't simply throw your hands up and say, 'Ah, you know my commander in chief powers now will be invoked' to declare an emergency, said Riley. For a president whose time in office has been defined by busting norms, and who relishes being different from his predecessors, it would be fitting that Trump could become the first president to have Congress actually vote to terminate an emergency declaration. There is an uncanny sense of we have been here before when it comes to the debate over border security. Today President Trump again travels to El Paso, Texas, to make his case for the wall. Negotiations are at a standstill again, and the stakes are the same. A partial government shutdown looms. President Trump has threatened that if he doesn't get what he wants from congressional Democrats, he could declare a national emergency to build the wall. Congress, though, could push back. NPR White House correspondent Tamara Keith reports. TAMARA KEITH, BYLINE: Under the National Emergencies Act of 1976, the president can declare an emergency for just about anything. As President Trump has considered using that authority to circumvent Congress and build a wall, that near unlimited presidential power has gotten a lot of attention. But it isn't the whole story. Congress also gave itself the ability to terminate an emergency declaration. But in the more than 40 years since the law was passed, only one member of Congress has ever tried it. GEORGE MILLER: It was a lever that we had, and we decided to use it. KEITH: George Miller is a retired Democratic congressman from California, and the year was 2005. GEORGE W. BUSH: There is a recovery on the way. There's progress being made. KEITH: In the aftermath of Hurricane Katrina, President George W. Bush issued a proclamation saying government contractors could pay workers less than usual for recovery-related projects. He justified it saying the conditions caused by Katrina constituted a national emergency. But Miller and others in Congress objected. MILLER: To suggest that they should work at lower wages was just an insult. KEITH: Miller introduced a resolution under the National Emergencies Act to terminate Bush's action. Under the law, the relevant committee had 15 days to consider the measure and vote. On day 14, President Bush announced he would revoke his own proclamation. That was the closest Congress ever came to voting to rescind a presidential emergency under the 1976 law. John Lawrence was a young congressional staffer back when the Emergencies Act was passed. JOHN LAWRENCE: The context of the time was Congress really on a bipartisan basis reaching to claw back power from what was then known as an imperial presidency. KEITH: But over the decades, Congress hasn't asserted itself. Here's Andrew Rudalevige, a professor of government at Bowdoin College. ANDREW RUDALEVIGE: The catch was that for them to actually rein in presidential power, Congress would have to take action. They'd have to pay attention. They'd have to be willing to go against the will of a president even of their own party. They haven't done that. KEITH: But that could change if President Trump follows through on his threat. A Democratic leadership aide tells NPR the House will vigorously challenge Trump if he declares an emergency, and that would likely include a resolution like the one Miller introduced back in 2005. If the Democratically controlled House were to pass it under the law, the Republican Senate would have no choice but to vote on it. Several Republican senators, including Roy Blunt from Missouri, have been cautioning the president, please don't put us in that position. ROY BLUNT: I have real concerns about it. But I'm not going to start talking about the floor strategy and how I'm going to vote and how the House is going to vote until we get there. And I hope we don't get there. KEITH: But if they do get there and a resolution were to pass, President Trump could still veto it. Until now, presidents have typically used emergencies in line with congressional intent, says Russell Riley, a presidential scholar at the Miller Center. But what Trump is contemplating would be different, he says. RUSSELL RILEY: Having gone to Congress repeatedly, having not gotten his way with them, you can't simply throw your hands up and say, oh, you know, my commander in chief powers now will be invoked to declare an emergency. KEITH: For a president whose time in office has been defined by busting norms and who relishes being different from his predecessors, it would be fitting that Trump could become the first president to have Congress actually vote to terminate an emergency declaration. Tamara Keith, NPR News. Transcript provided by NPR, Copyright NPR.